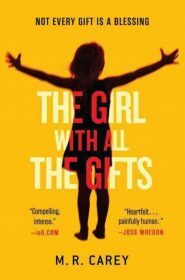 The Girl with All the Gifts by M. R. Carey grabbed me instantly. It opens with military men pointing guns at a 10-year-old, telling her to get into a wheelchair, and strapping her arms, legs, and head to the wheelchair. They then bring her into a classroom where other children are strapped down in the same way and she has school. What?! I went into this book blind, so I had no clue what was happening, but it doesn’t take long to figure out this is a different take on the zombie tale. That won’t ruin the book for you. It doesn’t take long to hear about the “hungries,” who are people infected with a virus turning them into rotting, non-thinking, non-speaking, zombie-like monsters that feast on human flesh. Civilization has been overrun, making humans create some walled community safe havens, one being a compound where Melanie and the other children are being watched, because they may be the answer that can end this virus. So there are hungries, humans, and then these people called junkers. Junkers are humans who did not want to be stuck in a walled community and who thought they’d face the world of hungries on their own. The problem with junkers is that they fight against the hungries and the humans, and when they attack the compound Melanie is in, she and a teacher, scientist, and some military men are on their own as they try to make their way to another safe haven. Throughout this fast-paced adventure, we get to see multiple perspectives. We see and discover new things with Melanie, but we also hear from her favorite, protective teacher, from the one-track mind of the scientist, and from the macho military men. All these characters look at this new world differently and I loved getting insight from all these angles. I wish the military men were fleshed out a bit more, because they were basically just macho, somewhat horny men, but I overlooked some of their cliched speeches and idiotic thoughts because the story as a whole was so strong and new. I don’t want to say too much more to give this away, but just know that this isn’t your typical zombie tale, and I mean that in the best way possible. We get zombie-like creatures here, but how they become hungries is fresh and innovative, and the tools humans designed to study and combat the hungries is something I haven’t seen before. And towards the end, the scientific elements involving the hungries and new virus strains is surprising and fabulous. If you want to read the same-old zombie tale, then don’t pick this up, but if you want something new and exciting, read this book. 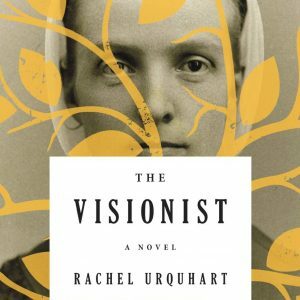 Just make sure to leave a lot of time to read it, or you’ll be up late reading like I was.